Welcome Home to this Stunning SINGLE STORY Home in the Wonderful Community of California Colony. This home has been elegantly updated with beautiful finishes inside & out, all new lush landscaping with solar path lighting, newly painted interior & exterior, new light fixtures throughout, and new luxury vinyl fencing for added privacy. Large front yard, with spacious private driveway including a two car garage. As you enter the front door, the high ceilings, the new custom moldings, the charming fireplace are just a few of the beautiful features of this home. The new elegant lighting, plus the wood style, porcelain tile flooring adds a richness to this Incredible Home. Gorgeous windows flood the rooms with natural sunlight, leading you to the impressive, fully updated, no detail spared designer kitchen. The kitchen features, QUARTZ countertops, SOFT CLOSE cabinets, custom cabinet built-ins, new stainless steel sink, 6-burner chef style range, stainless steel microwave oven & Bosch dishwasher. The Spacious Master Suite with soaring vaulted ceilings, plush carpeting, and an extra-large mirrored closet has direct access to the wonderfully appointed private yard. The bathroom features, all new lighting, dual sink vanity, lots of storage and an upgraded custom shower. Close to shopping and just minutes to Mission Viejo Lake where you can enjoy the lake amenities. LOW HOA! 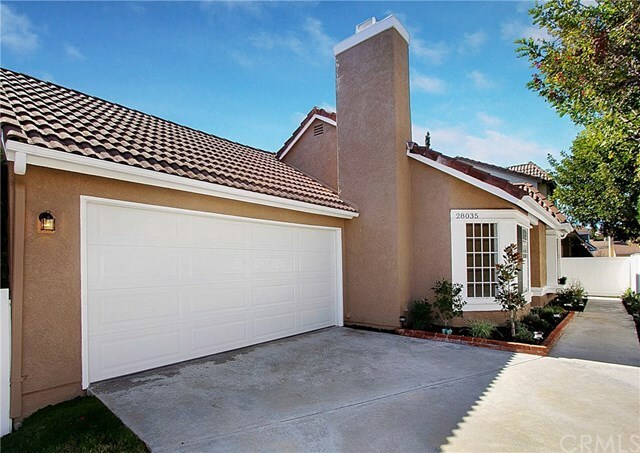 This is your opportunity to own your own home in Mission Viejo. Hurry it won't last long!